The Keithley 2400 is available to buy refurbished used or rent, usually from our UK stock. Click here to download the Keithley 2400 datasheet. The KEITHLEY 2400 is a member of Keithleys SourceMeter family of source measurement unit (SMU) instruments designed specifically for test applications that demand tightly coupled sourcing and measurement. All SourceMeter models provide precision voltage and current sourcing as well as measurement capabilities. Each SourceMeter instrument is both a highly stable DC power source and a true instrument- grade 6-digit multimeter. The power source characteristics include low noise, precision, and readback. The multimeter capabilities include high repeatability and low noise. The result is a compact, single-channel, DC parametric tester. In operation, these instruments can act as a voltage source, a current source, a voltage meter, a current meter, and an ohmmeter. Manufacturers of components and modules for the communications, semiconductor, computer, automotive, and medical industries will find the SourceMeter instruments invaluable for a wide range of characterization and production test applications. .
By linking source and measurement circuitry in a single unit, these instruments offer a variety of advantages over systems configured with separate source and measurement instruments. For example, they minimize the time required for test station development, setup, and maintenance, while lowering the overall cost of system ownership. They simplify the test process itself by eliminating many of the complex synchronization and connection issues associated with using multiple instruments. And, their compact half-rack size conserves precious real estate in the test rack or bench. The tightly coupled nature of a SourceMeter instrument provides many advantages over solutions configured from separate instruments, such as a precision power supply and a digital multimeter. For example, it provides faster test times by reducing GPIB traffic and simplifies the remote programming interface. It also protects the device under test from damage due to accidental overloads, thermal runaway, etc. Both the current and voltage source are programmable with readback to help maximize device measurement integrity. If the readback reaches a programmed compliance limit, then the source is clamped at the limit, providing fault protection. 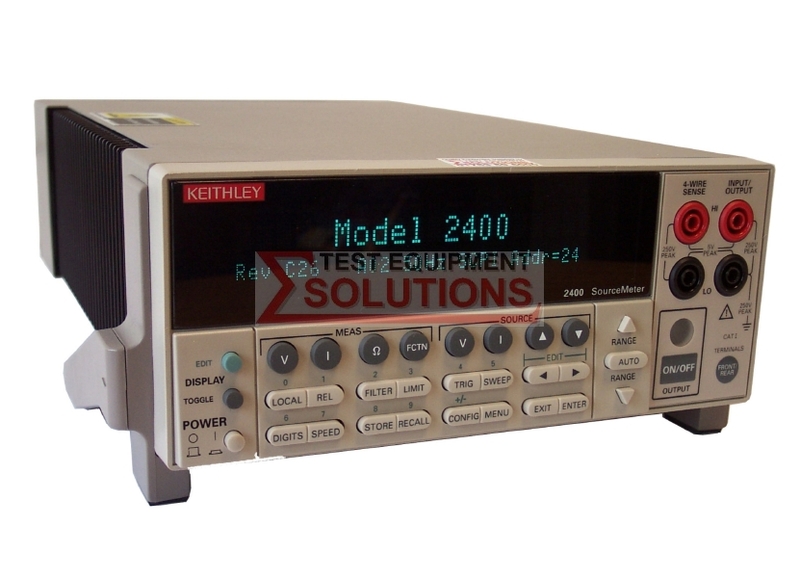 We offer the refurbished used Keithley 2400 200V 1A 20W Digital Sourcemeter for sale and rental. The Keithley 2400 is fully tested and refurbished in our in-house ISO9001 calibration laboratory. We supply manuals, accessories, full warranty and a free-of-charge Certificate of Conformity. We can also provide the Keithley 2400 with a fresh calibration for a small additional charge. If you have under-utilised test equipment talk to us about trading-in or part-exchanging it towards the Keithley 2400 or other refurbished test equipment.